TEIN FLEX A is equipped with new feature “Hydraulic Bump Stopper (H.B.S. )” which has been tested and proven effective in the world’s harshest motorsports including World Rally Championship and European Rally Championship. When a lowered vehicle goes over big bumps, urethane or rubber bump stopper often causes a big upward jolt and/or rebound and can disturb controllability. On FLEX A, H.B.S., mounted inside the shock absorber, effectively generates damping force near and/or at full-bump, to absorb big impact smoothly. Comfortable ride in vehicles even at full occupancy will revolutionize the industry. When Hydraulic Bump Stopper is not actuated, the valve is floating and is not blocking the oil flow through the base valve. Damping force is generated just as same as the shock absorber without H.B.S. through the base valve port and the friction of stacked shims. Once the piston rod strokes further than the certain point, the valve is pushed down to activate H.B.S. The port is made narrower, limiting the oil flow, to generate high damping force only near and/or at full-bump. The relief valve installed suppresses the sudden rise in damping force, when the inner pressure exceeds the certain level. By changing the components, operating point and/or damping force specification of H.B.S. can be modified to optimize the settings for wide variety of vehicle models. Ordinary shock absorbers have to have bump rubbers to avoid damages from bottoming out. Impact from hitting the bump rubber is huge and the energy accumulated by compressed rubber is released as repulsion force, causing unstable behaviors. With H.B.S., such impact is absorbed and converted to thermal energy inside the shock absorber, minimizing the shock and eliminating repulsion force. Twin-Tube System for Comfortable Ride on Streets! Considering the use of larger tires/wheels and the lowered ride height, FLEX A uses twin-tube system, in pursuit of ride comfort on streets. Full-length ride height adjustment system, used for FLEX A, enables adjustment of ride height by adjusting the case length, without changing the damper stroke length and/or spring pre-load. This has the advantage that the change in ride quality is kept minimal when the height is adjusted. Damping Force Adjustable to Change Ride to Desired Settings! FLEX A has ever-popular 16-level damping force adjustment (comp./rebound together) feature with the use of needle valve. By turning the adjustment knob, damping force (stiffness) is adjusted linearly step by step, to change the ride and handling of the car to suit driver’s needs/preferences. Use of well-reputed “ADVANCE Needle” at the needle valve for oil flow control widens damping force adjustable range to about 200% of the existing lineups. Whether it’s for the handling characteristics of sport driving or for the ride quality according to numbers of passengers, finding the most desirable setting is easier than ever. Use of EDFC turns 16-level adjustment into finer 32-level or 64-level adjustment mode (64-level only available with EDFC ACTIVE / EDFC ACTIVE PRO), to provide the optimum performance by fully utilizing the damping force adjustable range drastically widened by the use of “ADVANCE Needle”. FLEX A kit includes upper mounts exclusively designed for each vehicle model; either reinforced rubber mounts or pillow ball mounts. On shell case, TEIN’s self-developed one-of-a-kind “ZT Coating” is applied, for tougher protection against chipping, often caused by bounced pebbles, and rust. With zero claim rate, against adhesion, out of 500,000dampers sold, we are confident that people living in snowfall area or near seashores would even be very satisfied. FLEX A has adopted the new wrought aluminum spring seats and low-friction hard-resin thrust washers. These effectively reduces the friction with springs, caused during ride height adjustment, and makes it easier to adjust the ride height with pre-load on the springs. Shell cases are treated with “ZT Coating”, a superlow-friction fluorine resin coating, which is tightly baked onto the surface in-house. This special coating provides superior protection against rust and high lubricity, for keeping a smooth adjustment for a long period. FLEX A kit includes one-of-a-kind user-friendly ride height adjusting wrench. It has a 12.7mm (1/2in) sq. hole for attaching spinner handle and/or torque wrench for tightening at high torque. Available for Overhaul & Revalving! TEIN offers excellent after-sales service. TEIN shock absorbers can be overhauled to restore the performance as good as new. 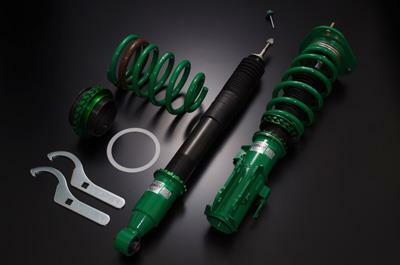 As TEIN shock absorbers can be fully disassembled, revalving service is also available to change damping force settings to meet customer’s preference.